18 years ago this tv ad for Molson Canadian featuring actor Jeff Douglas became the most famous tv commercial ever aired in this country. As time passes many reading, especially if a younger demographic, probably have never seen it. The ad is known as “The Rant” and it portrayed clean-cut, (Nova Scotia-born) Douglas as Joe Canadian. The script reeled off a series of fervent affirmations of Canadian identity ostensibly for a clueless America, but with Canada as the real, aggrieved audience. Joe Canadian ranted that we have a Prime Minister, not a President, a mistake in nomenclature Americans are prone to: even President Barack Obama tripped up on this. The Rant went on: “we don’t live in an igloo”, “or eat blubber” (well, some do actually, but it’s broad-brush marketing), or “know vacationing Suzy whom you once met on a Florida beach”, etc. The tone was strident and made good fun of age-old American myths about Canada but in an exaggerated, almost tongue-in-cheek way. The effect finally is somewhat self-deprecating, so Americans will know when push comes to shove we really love them. The quaver in the actor’s voice is part of it: Joe Canadian expresses pride but not quite self-confidently. It’s the passive-aggressive mode, the perfect vehicle to express how Canadians feel about the U.S. (and a form of discourse Canadians are often comfortable with, in our view). It’s like in all families: strains occasionally show. Similar ads followed until, of course, Molson flip-flopped and joined Colorado-based Coors. But for years the spots helped keep Molson Canadian high in the brand rankings. Even today “Canadian” is the third or fourth largest seller nationally, behind Coors Light, Joe Canadian would be saddened to know. Molson Canadian was originally called Crown and Anchor, see my earlier notes, “Molson’s Rice Beer”, here. I reproduce a 1955 American news ad that states innocently the brew included rice. In the next few years, similar Crown and Anchor ads appeared in northeast U.S. newspapers but sans the rice appellation. Molson surely figured out that in an ad for premium beers, the usual context at least in America, rice was not the best idea. (It’s verboten in German lager-brewing, the model for the Molson Canadian type of beer). Molson’s first plant in Ontario (Toronto) opened in 1955 and Crown and Anchor poured from its vats the same year. Until then Molson had brewed solely in Montreal. Once established in Ontario though Molson clearly had the U.S. market in its sights, too. I recall the beers being sold around 1970 in upstate New York when I lived in Montreal, they had cachet. Local students and U.S. airmen from a now-closed base in Plattsburgh, NY drank “Molsons” in the roadhouses. When visiting there I was into Schaefer and Michelob. (The lure of the foreign, it was always thus). Molson’s push into Stateside deepened after it set up its Martlet distribution arm in 1971 in L.I., New York. In the 1980s-90s Molson finally went big in the U.S. imported beer stakes, second only to the likes of Heineken. Molson Canadian, Golden, Export, and Brador were the main brands. The crown and anchor imagery has been part of Molson’s history for a long time. It appeared on our oldest brand (Molson Export) which dates back to 1903 and still appears on our Stock Ale brand. And, as for Molson’s first entry into the lager market, the Crown and Anchor brand was followed very closely by Molson Canadian which was launched in 1959 – hard to believe that brand is already 50 years old. Examining a dozen or so books on Canadian and Ontario beer history and other sources, I cannot locate a discussion of why the new name name was chosen, the specific theory and rationale. By 1960, branding was as sophisticated as today. Market surveys, attitudinal studies, focus groups, were mothers’ milk to manufacturers and marketing agencies. Companies as established and consumer-dependant as Molson didn’t turn on a dime when adopting new branding strategies: they thought things through. Today, the name Molson Canadian seems natural, normal, burnished by 60 years of successful history. But was Molson Canadian a “normal” name to adopt in the Canada of 1959? The answer is deep in a file folder in a Molson-Coors vault. Pending that turning up, let’s posit why the name was changed to Molson Canadian. One plausible reason is Molson wanted to give its newish Toronto lager a more local image. Molson at the time, as an old Montreal business, had little or no Ontario resonance to most consumers. It must be remembered too that Quebec in Ontario means “French” to most, a part of Canada of course but different than ROC (rest of Canada). To sell Crown and Anchor successfully in ROC, the brand had to speak to them, in a word. What better way than to call the brand “Canadian”? The ingrained patriotic character was just a plus, made brilliant use of in The Rant many years later. 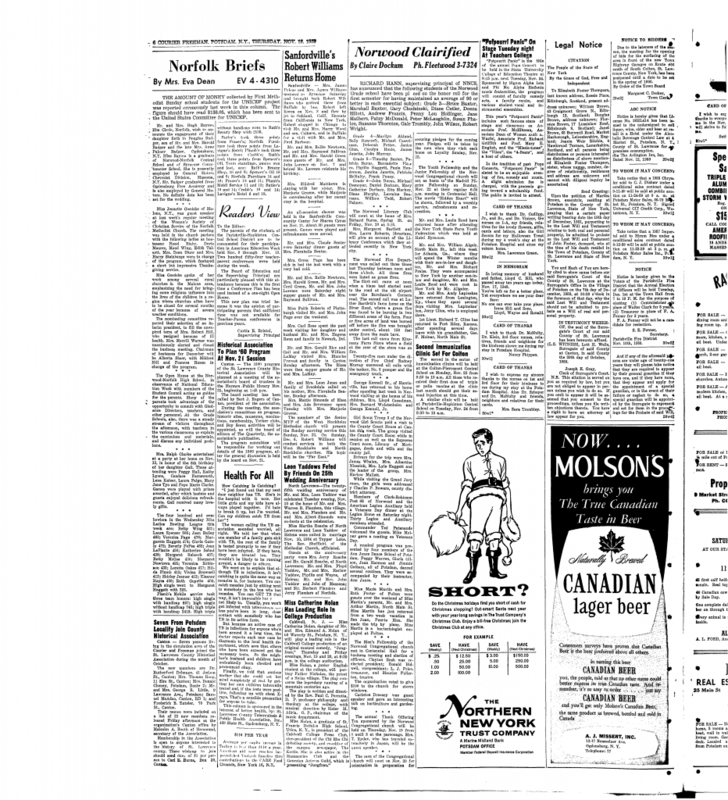 The wording is not 100% clear, few ads of the modern type are (rather intentionally, we think), but it seems to say Molson chose the new name by surveying U.S. beer consumers. An intended push in that market could be the only reason. But there’s another possibility. Canadian considerations (as mentioned) inspired the name but it worked out fortuitously to tell Americans they did so, given their known preference for “Canadian beer”. Which is it? Or is a third explanation the real one? It would be ironic if the hyper-patriotic name Molson Canadian had origins in the United States, to which Joe Canadian stood up, but stranger things have happened. Note re images: the first image above is from the Molson Canadian listing at the Beer Store, here. The second is from from the NYS Historical Newspapers site linked in the text. All intellectual property therein belongs solely to the lawful owners, as applicable. Images used for educational and historical purposes. All feedback welcomed. Seems to me, Gary, that the 50s was when our big breweries were going national, following EP Taylor’s example of buying up smaller breweries in other provinces. I believe Labatt Blue was the first national brand in the early 50s. 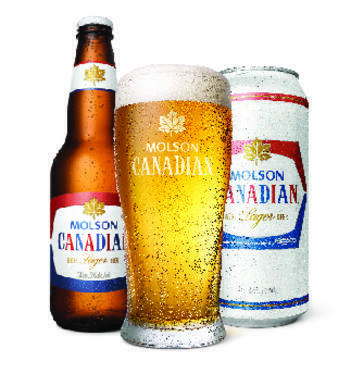 Molson followed a few years later, and it would have made sense to give it a national name like Canadian rather than a name that would have registered in Quebec and Ontario but nowhere else. Nick, good to hear from you. What you said makes sense at first blush, yet how do you square that with the wording of the 1959 advertisement in the Potsdam, NY newspaper? This same ad appeared numerous times in the New York State press. It states “Consumers surveys have proven that Canadian Beer is the beer preferred above all others.” – this must mean surveys in the U.S. – and “In naming this beer CANADIAN BEER you, the people, have told us that no other name could better express its true Canadian taste”. Does it not suggest the beer was re-named after sounding American beer drinkers in surveys? The words “You, the people” seem as well to echo the familiar “we, the people…” from the U.S. Constitution, which would reinforce the American context.